Focus on the reading while we worry about the details. Reading Log+ is an app that takes away the burden of tracking your kids’  reading progress and puts the focus back where it needs to be - on the reading. Many schools require students to read a certain amount of time or number of pages per week, asking the kids and their parents to report their reading back to the teacher. While the reading is fun, the process of recording pages and time can be tedious for parents - especially since those hours between school and bedtime are often jam-packed with other activities, dinnertime, and chores. Reading Log+ allows you to focus on the fun through an easy tracking system which will generate a report you can email or print when you need it. Let Reading Log+ do the heavy lifting for you. - Barcode Scan your book library with your device’s camera. 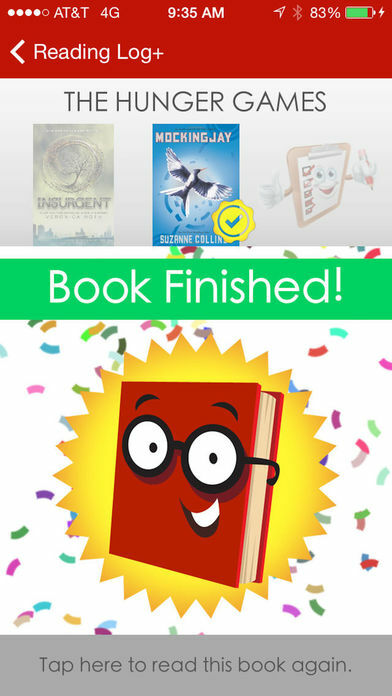 - Automatically pull in all book information including cover art. - Set goals for pages and minutes read or completed books. - Goals can be weekly, monthly or use a custom date range. - View your running progress in real time with colorful bar charts. - Count Down Timers with push notifications when the time is complete - even if the app isn’t running. - Direct print reports using AirPrint. - Sync your data between devices by using iCloud or Dropbox. Your data will stay backed up to the cloud and in sync automatically. - Give your kids the ability to track their own pages, minutes read and completed books but you have the ability to approve their progress. - Access unapproved activity for all your readers in one place. - Do you want to keep one child from seeing the data for other child? Use the child lockout feature for this. We are certain that Reading Log+ will meet all your family reading needs. So, make the leap with Jump Gap Software's Reading Log+.